Apple Pen With GPS and Phone Features? Will Apple release a pen with GPS and phone features? 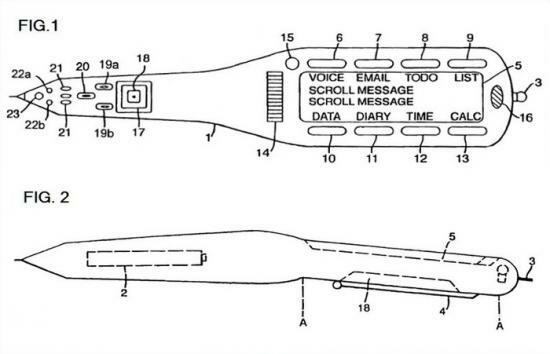 The U.S. Patent and Trademark Office has reissued a patent to Apple for a mobile computer encased in a pen, adding cellular and GPS capabilities. Originally assigned to British Telecommunications PLC in 1998, the U.S. rights were transferred to Apple in 2008 but the patent was reissued Tuesday with additional features included, Apple Insider reported. The original patent describes a multifunction device equipped with a pair of accelerometers to recognize handwritten input and a built-in display; the new patent adds 11 new claims to the original, most having to do with cellular connectivity and GPS capabilities. As described in the patent, the built-in LCD screen would be accompanied by multifunction buttons and a touch strip to navigate through written messages or other stored information. The patent also cites support for sound input/output components that can be used to process speech-to-text and text-to-speech.